We're experimenting with Salad People and More Real Recipes: A New Cookbook for Preschoolers and Up by Mollie Katzen. We check out a new cookbook every few weeks, just for fun. It's a frugal hobby I'm learning along with the kids. I liked that Katzen's recipes feature basic, whole (even cheap!) ingredients. My kids liked the 2 page illustration that follows each recipe. Steps are translated in kid-friendly terms. "Pick 15 basil leaves." "Add 6 shakes of salt." 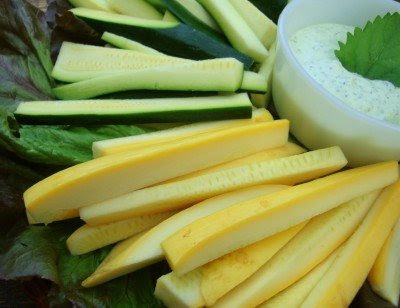 Though it lacks that MSG zip of ranch dressing, the kids did eat it with squash cut into spears. Even more important: the picking, pureeing and dipping got us through another long summer afternoon. Free tip: you can check out more garden friendly recipes at the Mollie Katzen website. 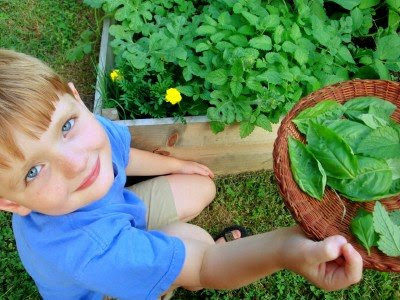 boy your garden looks satisfyingly healthy! We have had so much rain, everything here is stunted. My dearly loved basil is yellow! i companion planted onions and shallots with tomatoes, waiting to see if they truly do improve texture and taste this year. How have I never read your blog? I still can't get over it. Boy, you're not kidding about long, hot summer afternoons! The heat index here today, this afternoon, is going to be....108 degrees, with uber-high humidity!!! Good grief, that's about unbearable in my book! And then, to make it worse, we have to drag into Peoria(about 50 minutes away) for driver's ed for my 15 year old. And it seems like even when you're in and out of an air-conditioned van and stores, the heat is still just about unbearable. So anyway, that's what's happening in Central Illinois today! Andrew is about as cute as they come! The garden looks wonderful, and the whole garden cokbook thing sounds like something we would like, too. My husband and the kids (not so much me because I am always inside it seems, cleaning up!) have an enormous garden, so we're always looking for good ideas for when the produce comes rolling in! Have a great day, Meredith. Stay cool! no clutter - no mess forever = 2 weeks turn in - works. Nice little trick in my apron pocket that I've used lots! The books look great. Your artwork is adorable. I love your site! We borrowed "Pretend Soup" a few weeks ago, and even though my children aren't preschoolers, they loved it! And Sabrina loved it on celery. I love anything that utilizes fresh herbs - thanks for leaving it behind! The boys and I have been dabbling and experimenting in the kitchen lately... anything to fill a hot summer afternoon indoors. Thanks for the tip on this book. I'll look for it at the library. I love Mollie Katzen's cookbooks! I don't think I've checked out Salad People yet. Thanks for the recommendation! We love the library too - it's our favorite frugal habit! Traditional Ranch dressing has lots of salt and some sugar in it - perhaps adding a bit to this recipe will give it the zip you are used to! We love making dip - the favorite here is my sweet dilly dip! Very simple, and always a hit! We love those books (both Salad People and Pretend Soup) - bought them when my kids were three and have used them extensively. They're exceptionally good for prereaders and developing readers (and the food is good too). 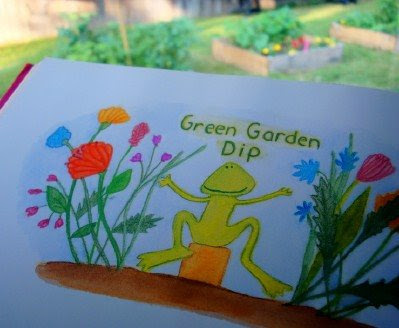 sounds like a yummy dip recipe - looking forward to trying it once our garden veggies are ready to be picked! thanks for sharing! we love her books, all of them. i have blogged about cooking with my kids from her books also! (see below.) nice post, meredith! We love the library at our house and go every Wednesday. I will have to try that dip with herbs from my garden.